Ted Politidis, SEO Expert and Coach; Ranks in many regions in Spain, the USA, the UK, Canada, and Australia for SEO terms; Masters Degree; 10+ years in Digital Marketing; Google Certified Partner; SEO Certified by the University of California, Davis. The Spain SEO Expert increases your pages' visibility and traffic. I have a unique SEO strategy that produces first page rankings. 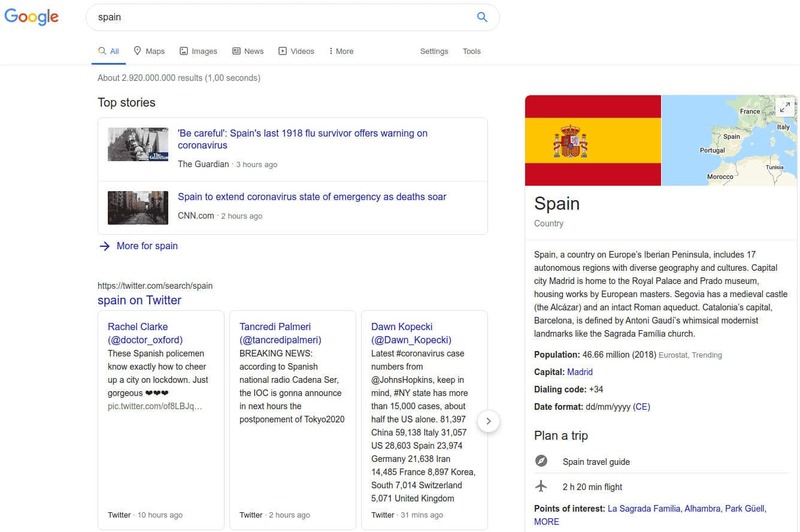 You will have more traffic and SEO conversions in Spain. Take this unique opportunity to see your pages ranking on the Google First Page. Start the project and allow a few weeks to get things rolling. Projects usually take up to six months as they include many niche search terms or topics. My ten years of experience in SEO deliver quality traffic that helps the lead generation. I optimize your content for Google Search, Google Maps, YouTube, etc. Very few online channels are free, and SEO is one of them, a free traffic source. To make it to the first-page one has to pay for the optimization or do it in-house. But the search engine placements have no fee as in Google Ads. Plus, SEO drives enormous amounts of traffic in contrast with the paid channels. An excellent project timespan starts from six months with steady and reliable growth. For competitive niches, you need to factor in more than six months. To make sure you get enough SEO conversions you need the most visibility in search results. Prospects will likely click to visit your pages that have top placements and optimized descriptions. So, it's about having the best spots with the best text. Every element on your pages needs optimization. I have a unique approach that performs as expected in any niche and uses many online sources. My target is quality traffic, people who are looking for your solutions/products. I focus on natural, human clicks. That said, I use no shady tactics like backlinks, automation software, or PBNs. Shady tactics and gimmicks break SEO performance. When a Google update rolls out, your competitors may see a demotion. Instead, each Google update will bring you better positions. Start growing today. I provide you the best visibility and top quality traffic that generates leads or sales. I make up an SEO plan that contains growth with no risks. Boost your business with a reliable, consistent, winning partner. Barcelona -- Ibiza -- Madrid -- Majorca -- Malaga -- Seville -- Tenerife -- -- Valencia -- Zaragoza.